Hodgson’s Carnacki owes much to the immortal Sherlock Holmes. I’d venture to say that if there had been no Sherlock Holmes, there would have been no Carnacki. 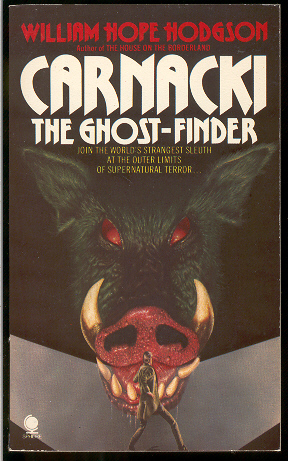 Often, Carnacki’s detective skills are overshadowed by the occult nature of his cases but astute readers will see that he employs many of the techniques of the ‘great detective’. One bit of borrowed style is the off-hand mention of ‘lost’ or ‘untold’ tales. Doyle’s stories are full of tantalizing titles like “The Giant Rat of Sumatra” so it’s no surprise that Carnacki’s tales are as well! In “The Horse of the Invisible”, Carnacki mentions a case involving a “child’s hand patting the floor” but gives no title for the incident. Likewise, in “The Searcher of the End House”, he references a case involving a client named “Maaethson” but no further particulars. What could these enigmatic cases be about and why are there no records of them? Many later writers attempted to bring to life those cases that Holmes mentioned only briefly so maybe it’s time for new writers to finally tell these ‘lost’ tales? Perhaps some already are! I certainly find these “lost” tales of interest as well, seems like an anthology ripe for the makings!! Hodgson’s [Carnacki’s] allusions to other cases peaks the interest like a sharp, nagging hook, and I have leafed through collections looking for clues to them, hoping for cross-reference. I always took ‘The Grunting Man’ to be Bains in ‘The Hog’, though? That could be. Interesting interpretation! Great idea that begs exploration!